While I wouldn't classify myself as a Woody Woodpecker fan, exactly, the character was ingrained into my childhood in several different ways that made the prospect of checking out a live-action movie somewhat appealing. On top of seeing many of the cartoons and learning how to belt out the bird's signature psychotic laugh, Woody's wild locks and facial expressions made up one of the first cartoon characters -- more so than Mickey or Bugs -- that I learned to draw while developing the hobby of my youth. So when the high-pitched giggling and spiky red-feathered appearance zoomed onto the screen for the trailer, a bit of nostalgic excitement shot through me … which quickly disappeared when viewing the live-action movie that was trying to exist around him. 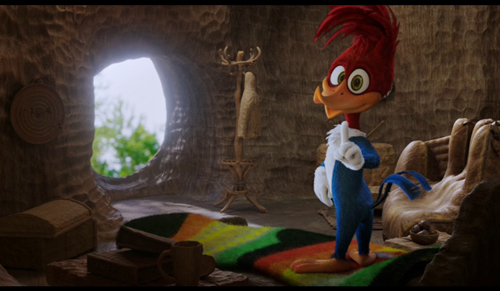 The hopes that maybe the length of a feature film spreading the inanity out might benefit Woody Woodpecker proved to be for naught, as this live-action, computer-generated hybrid is an erratic and wholly unfunny mess from start to finish. Out in the middle of the forests in Washington, Woody Woodpecker (voiced by Eric Bauza) lives a relatively carefree life, dodging the pursuits of hunters and raiding campsites for food whenever people come to his neck of the woods. He's reportedly the last of his species, making him a valuable commodity to poachers. Elsewhere in Seattle, a high-profile lawyer, Lance Walters (Timothy Omundson), gets removed from his position at his firm, and his upcoming free time has sparked an idea in his head: to take a stretch of lakeside real estate that his family owns and build a ultra-modern home, which he and his ritzy decorator fiancée Vanessa (Thaila Ayala) hope to sell for a profit. With his semi-estranged son (Graham Verchere) in tow due to a family crisis, Lance heads out to survey the land, only to discover that there's a chaotic woodpecker complicating matters. A war begins between the lawyer and the bird, eventually getting local poachers and park rangers involved, as Lance tries to figure the right things to do involving his property and his son. It's no secret that cartoons from the ‘40s and ‘50s were peculiarly violent, but the exaggerated animation styles -- and the fact that they mostly involved animals being violent with other animals -- made it so that there was enough divorcement from reality to not be all that disturbing. The opening scene of Woody Woodpecker shows that it's going to try and bring that embellished slapstick violence to the live-action realm, in which Woody tricks two human poachers into aiming and firing rifles at one another; that they're using knockout darts instead of live rounds doesn't really take away from the imagery. The woodpecker isn't done there, either, deliberately causing construction workers to electrocute themselves and igniting a gas-powered stove with someone inside an RV. Since the humor solely relies on the slapstick nature of the violence, these scenes result in the widening of eyes instead of sparking laughs, and that's because these calculated hazards created by the woodpecker are in an overtly family-centered film. Had Woody Woodpecker gone full-throttle into being a sadistic, adult-intended sendup of the brazenness of classic cartoons, pushing the limits of the bird's lunacy, it possibly could've worked on a completely different and unusual level. However, Alex Zamm attempts to balance the chaos with obligatory family drama involving the problematic father-son relationship, the dejected teenager finding his place in a new town, and the wealthy urbanite building some understanding of the outdoors. Much like a cartoon or many other TV or DTV family movies, the surrounding storytelling is frustratingly simplistic, where high-profile lawyer Lance can just through throw heaps of money at any problem with his house construction. Zero surprises are to be found in what happens along the way, falling into cliché after cliché that are only marginally boosted by Galavant's Timothy Omundson sarcastic energy, who awkwardly fits between the live-action dramatics and cartoon shenanigans. The most jarring aspect of Woody Woodpecker comes in how the animated bird himself swirls together with the tangible world of humans, underscored by incongruous CG effects for the bird and lackluster acting from all involved. Unlike how Who Framed Roger Rabbit directly handles the line separating toons and humans, Woody ends up being the only animated aspect in a real-world environment, persistently breaking the fourth wall by chatting with the audience and going about his business as a near-invincible tornado that doesn't obey the laws of nature. 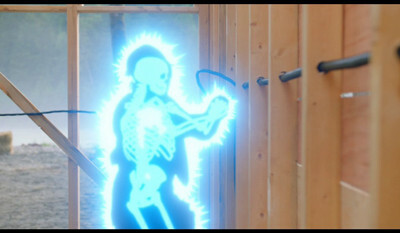 With an insufferable voice and fondness for destruction, the fact of the matter is that Woody straight-up isn't a likable character -- though, home owners may be quick to point out that he's pretty much in-character for a woodpecker -- and that isn't helped by his constant bird-dropping antics and fart jokes. Woody Woodpecker gets a whole lot worse as it approaches family-movie redemption and peril, so first instincts about what's already going on should be considered, whether it's for a new generation of kids watching the bird or for the mildly nostalgic. Since there wasn't a Blu-ray release for Woody Woodpecker, it's unsurprising that the standard DVD transfer from Universal really hits the nail on the head, presented in a 1.85:1-framed, 16x9-enhanced image. Nature textures -- woodgrain, rocks, dense forests, etc. -- offer solid and convincing details throughout, while close-ups on faces and the sharpness of Woody's computer-generated design are strong enough (when upscales) to make one forget that they're watching a regular old DVD. Colors are hyper-saturated as intended, with bold blues and reds in Woody, overly-vivid greens in trees, and warm skin tones through, but aren't dialed up too high to seem outside the intentions of the image. Black levels during campsite scenes and outdoor festival shots are deep and nicely balanced, and the presence of pixilation is kept to a minimum, though some faint ghosting and garbling can crop up in brisker sequences. The Dolby Digital 5.1 track bothers me, though, largely because it's so good at just about every other aspect of the track … except for the volume level of Woody himself. On the positive side of things, the sounds of construction and ambience of the woods are handled incredibly well by the legacy track. The spilling of concrete, electric shocks, and rumble of equipment provide crisp, hefty effects from the front channels, while the zipping-around of Woody and the little nuances of forest life engage the full surround stage with a fine amount of responsivity. Yet, while all the rest of the dialogue sounds reputable in its enunciation, suitably hitting high points and midrange bass for naturality, almost every instance of Woody's dialogue comes across as compressed and flat -- despite being clear enough to hear him -- which really doesn't help with getting immersed in the scenario. These ten minutes of extras are actually kind of fun, more entertaining than the film itself. The Evolution of Woody (5:35, 16x9 & 4x3) delves into the evolution of the character, both figuratively and literally, illustrating how the tone of the characters has been tempered over the years and how his physical traits have also smoothed out. Interviews with the cast of the live-action movie offer their perspectives on it, which of course bleeds into the standard Making of Woody Woodpecker (3:13, 16x9), which mostly centers on Woody's attunement to nature and rendering the physical comedy in the film, and sneakily includes a few tidbits about the film (such as how they used oatmeal as cement). And Working with Woody (2:50, 16x9) takes a look at how they cobbled together generations of Woody into the film's version, and about how the star of the film everyone was shooting … was never actually there. Woody Woodpecker is a strange bird, blending live-action slapstick akin to ‘40s-‘50s cartoons with family-drama afterthoughts to give it a little substance. Almost every attempt at humor gets thwarted by how bizarrely violent the antics seem in a real-world environment, and the zaniness of Woody himself comes on strong without a streak of genuine likability to him. What results is an hour and a half of confused, near-laughless filmmaking, leaving one more surprised that it's intended for family audiences. Morbid curiosity about what Woody's turned into over the years should only get someone to the rental stage with this one, and even that kind of interest won't really be rewarded with this annoying flight down memory lane. Skip It.